This week’s SW Florida real estate video update presented by The Ellis Team at RE/MAX Realty Group focuses on SE Fort Myers Florida. SE Fort Myers consists of zip codes 33912, 33913, 33966, and 33967 and covers Gateway, Fort Myers South around the Daniel’s Parkway Corridor over to US 41 down tthrough San Carlos Park. View this week’s SE Fort Myers Florida Real Estate Video Update Average prices were down about 22% in SE Fort Myers, however sales were up significantly. 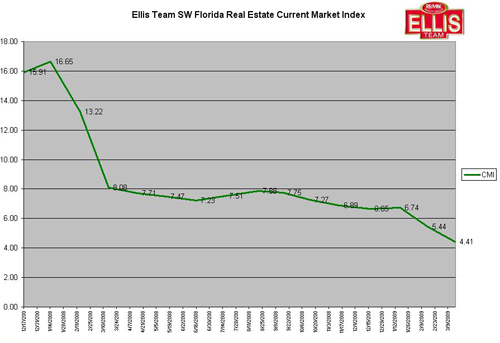 The March 2009 Ellis Team SW Florida real estate Current Market Index covering Fort Myers, Cape Coral, Bonita Springs, Estero, Ft Myers Beach, Sanibel and Captiva Islands, and Lehigh Acres Florida improved again as sales activity has really taken off in the past 6 months. The Index now stands at 4.41 for Cape Coral and Fort Myers, and stands at 5.07 for the entire Lee County Florida. Inventory levels countywide hade dropped to just slightly over 13,000 while pending sales have shot up to 2,567, and increase of 22.53% since last month. The market is absorbing new inventory. This 2009 season has been as good as predicted. remember, the Current Market Index is a forward looking indicator, and home sales have been bearing that out each and every month as we’ve been reporting. Cape Coral again leads the way. The CMI numbers for Cape Coral are 3.45, the best in SW Florida. Condo numbers were down to 10.90, down from 13.08 in February, another positive sign. We do see some serious trouble on the horizon for the condo market in SW Florida we’ll be reporting on later. Follow The Ellis Team on Twitter, so you can keep up to date on Fort Myers and Cape Coral real estate news and information, including information on the entire Southwest Florida real estate market. Our latest post on Twitter includes our Cape Coral real estate video update. Check our our Ellis team SW Florida Top Agents page on Twitter. This week’s SW Florida real estate video update presented by The Ellis Team at RE/MAX Realty Group focuses on cape Coral Florida. Cape Coral is leading sales transactions in Lee County due to the number of foreclosures and short sales bringing affordability back into the SW Florida real estate market. View This Week’s Cape Coral Video Update. Posted in Cape Coral, Cape Coral Real Estate, Uncategorized. The Ellis Team at RE/MAX Realty Group in Fort Myers released the Annual SW Florida State of the Market Report in February. Local TV stations covered the release and here are some of the stories. Download the State of the Market Report In this report we detail the Fort Myers real estate market, along with updates on the Cape Coral real estate market, Lehigh Acres home sales, Bonita Springs and Estero real estate updates, Sanibel and Captiva, Fort Myers Beach, Pine Island, and all of Lee County Florida. We’ll be uploading more video in the coming days, so stay tuned.